In another instalment written by expert bloggers on cities in Spain, this time we’ll be looking at Malaga. With their insider knowledge you’ll find out how to enjoy a low cost mini-break in the Spanish city they call home. Joanna Styles is the author of The 5 Best of Everything in Malaga. Read her tips on how to spend a weekend in Malaga on a shoestring. Malaga might be the capital of the Costa del Sol, home to the luxury resort of Marbella, but it’s a surprisingly cheap city. In fact, you’ll probably be pleasantly surprised to discover that having a cheap weekend in Malaga is easy. Start with your flight to Malaga – book well in advance or take advantage of seasonal offers to get the best deal. Dozens of airlines including lots of low-cost companies fly to Malaga from all over Europe so it isn’t difficult to find a cheap flight especially if you travel out of season avoiding the summer months and Easter Week. If you’re travelling from somewhere in Spain, check out good deals on bus travel and the high-speed AVE train. If there are four of you, have a look at getting ‘Mesa’ tickets on the AVE – you buy four tickets around a table (mesa) at hugely discounted prices. Once you arrive at Malaga Airport, your cheapest option is the Cercanías train – get it directly from the Airport and get off at the last stop (Malaga Centro Alameda). The journey takes 12 minutes and costs €1.80 one way. This comes super cheap because you probably won’t need to use public transport at all. Malaga is a very flat city and just about everything you’ll want to see is bang in the centre. And even the few must-sees on the outskirts can be reached by a short bus journey (€1.30 each way) or by walking. Top tip: if there are several of you and/or you plan to use the bus a lot during your weekend, buy a bono-bus ticket from an estanco (tobacconists) or kiosk on the Alameda Principal. These cost €8.30 for ten bus trips. If your weekend in Malaga falls out of season or you pick up a special offer then even top-of-the-range hotels come surprisingly cheap. It isn’t difficult to get a double room in a 5-star hotel in Malaga for just over €100 a night (and that’s for two). The secret lies in planning ahead. But even if you leave it until the last minute, there are plenty of hotels in Malaga offering quality accommodation in the centre and at a good price. For example, two nights in a decent hostel mid-season cost around €60 (and again that’s for two people). Top tip: don’t forget apartment accommodation – you get more space and flexibility for your money and because they’re self-catering you can save on meals out. We recommend Hoidays2Malaga. 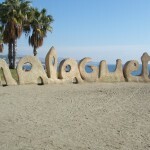 Most things to do in Malaga come with a cheap price tag and there are many free activities. The combined visit to the Alcazaba Fortress and Gibralfaro Castle is particularly good value at €3.55 and even the best art museums in Malaga (e.g. the Picasso Museum and the Russian Museum) cost just €6 to get in. Beaches – both the city beaches in Malaga are blue-flag and free to visit. You can get to them easily from the centre. Free shade can be found in the palm oases along the sands or you can treat yourself to a lounger and sunshade at one of the beach bars (from €4 a day). 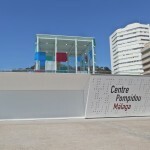 Contemporary Art Centre (CAC) – lots to see here including some of the world’s top contemporary art. And all for free. Monuments and art museums – free on Sundays after 4pm. Go early to be sure you get in before the crowds. 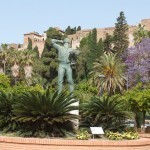 Parks – all the parks in Malaga are free. Make the most of those in the city centre (Paseo del Parque and Jardines de Pedro Luis Alonso – opposite City Hall) especially in the spring. The roses are fabulous in May and June. Port – most of the east end of Malaga Port has been pedestrianised and become a great place to stroll and take in the city views. Start in Plaza de la Marina and make your way along Muelle Dos under the spectacular pergola to Muelle Uno where there are excellent views of the Malaga city skyline. Street art – the Soho district (between the CAC and the Port) has some exceptional murals by renowned artists such as D’Face and Obey. Lose yourself in the streets and check out the murals – don’t forget to look up as well as down. The city boasts a big foodie scene and although there’s currently only one restaurant with a Michelin star, several others in the running. But that doesn’t mean eating out is expensive. The secret lies in choosing your venue. Stray slightly off the tourist track (and you don’t have to go far) and restaurants offer a generous and delicious menu del día for €8. And that’s three courses plus a drink and bread, and you’ll probably be sitting at a table in the sun. But even a front-line beach restaurant needn’t be expensive. 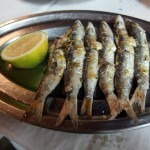 Beach bars in El Palo and Pedregalejo districts to the east of the city offer grilled sardines for €2. Add a drink and you’ve got a snack for €4. Paella (seafood or meat and seafrood) starts at €12 for two and there’ll probably be more in the pan than you can eat. Top tip: go for venues favoured by locals – look for restaurants and bars that are busy from 2pm for lunch and from 9pm for dinner. Joanna Styles is the author of The 5 Best of Everything in Malaga, an app for mobiles and tablets (iOS and Android) with over 210 listings in Malaga, all bang up-to-date and all mapped. This essential Guide to Malaga costs €4.99 and is available here.